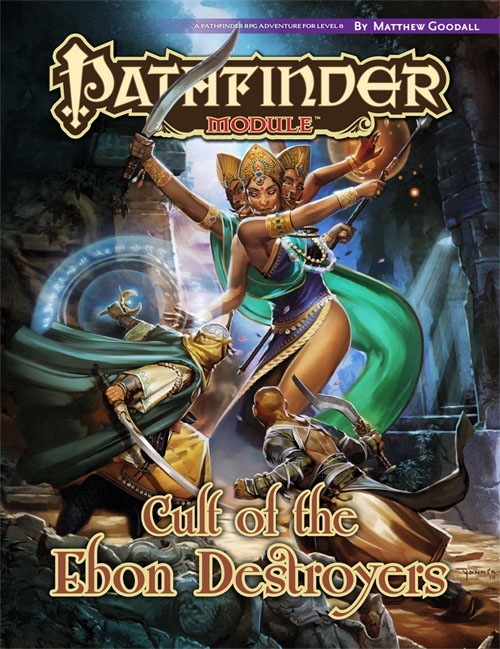 Cult of the Ebon Destroyers is sanctioned for use in Pathfinder Society Organized Play. Its Chronicle Sheet and additional rules for running this module are a free download (240 KB zip/PDF). The goal of this module is to stop an evil Vudran cult from taking over. I liked the "Indian"-flavored touches that were present throughout. However, I felt that the last, 10th Level encounter would be a bit too tough for a non-optimized group of 8th Level PCs. PCs can make it easier on themselves if they figure out what special powers and advantages the Big 3 Bad Guys have in advance, before they attack their hidden temple. The encounters are all cinematic set-pieces (no boring 15-by-15 rooms here! ); they reminded me of the "Mortal Kombat" movie (which in this case is a good thing). It has very, very well-ordered mechanism for investigation, and battles. Sidebar is much more helpful to novice DM than Paizo's any other modules. Villians are all through about everything...it makes sense on reallistic comparison. Chapter 3-especially boss encounters without rest- are truly brutal, but PCs have many chances to exclude two of them in final battle. So this is valuable for my full stars. I have played this as part of PFS. I have neither read nor run it. I enjoyed the challenging encounters and I like investigating but the adventure felt like: go talk to this list of NPCs to proceed and actually figuring anything out was mostly irrelevant. Due to language barriers most of the players spent the investigative portion of the adventure sitting around bored. I played an outgoing character with a lot of knowledge and charisma skills and found myself super useful, and personally I had a lot of fun, but the boredom of others dragged me down a bit. I had the pleasure of playing this mod at the Ruby Phoenix convention in Sydney. I'd travelled from Darwin to attend the con, so I was really stoked that a lot of high quality modules were on offer... including Cult of the Ebon Destroyers. The lead-in to the mod is excellent. There's a lot of flavour and a real sense of 'you are there' put into the module, with a lot of nice touches like pre-generated divinations and the like. That made my day. It can be frustrating, though... this module has a reputation for being very tough, but the first part really requires a social face, a skill/knowledge type person and someone who can cast divinations. This might suggest that it's a social module where you can bring your "non-combat characters" and have a ball, and for a time it seems like you're right. Then the combat hits, and wow. It's brutal stuff. Extremely high AC combat munchkins coming pre-buffed, lots of monks with moderately difficult fort saves (fighter-types need only roll 1s to fail, but there are a lot of them), and you're fighting in their home territory so the terrain is perfectly geared towards maximising their advantages. We had a very optimized party (although we lacked ranged and/or arcane support) and we couldn't complete the module. We had two PC deaths including our two toughest characters, and the rest of the party were stat-drained/negative levelled to the point they were ineffective. The combats are unique. Flavourful. Interesting. And, one must remember, you're fighting a death cult. They're not weak and soft and squishy -- properly run, they should go for the throat at all times, including coup-de-grace and other such things. They're death cultists and should be played appropriately. The lead-in was extremely flavourful, the roleplaying was excellent, and the overall story remarkable in its execution. I think the only bad thing I have to say about this module is that it needed to decide if it was a social/investigative or a combat-fest... it tried to be both, and while it pulled it off really nicely, you have to bring a fully optimized party to this or you're going to either get stuck in the first half or die horribly in the second. But what's the point of playing Pathfinder if there's not a chance of death? Honestly having played this it was the toughest and most challenging series of games I have played to date in PFS and honestly the most fun I have had, every single challenge was worthy of our team of adventurers and there was no need to hold back for fear of outshining the combats. The investigation stage was extremely well written and performed masterfully by the GM, with the party having to work together and pool our abilities to accomplish the task. The Combats were well ran and extremely well built giving me a new appreciation for the capabilities of NPCs, honestly I havent felt this much of a threat to my PC's survival since I started PFS and I would love it if every game felt this challenging. All in probably among the best hours I have had playing PFS, I will admit if you arent in to serious challenges maybe you should steer clear of this one, but if you want to have a blast against challenges that will test you to your limits this is definately the mod for you. Congrats, Matt! This is gonna be awesome, I can already tell. Also congratulations Matt, like yoda, I'm really looking forward to this as well. I should probably mention that the cover is just a mockup. You didn't get a cover commissioned and completed in the hour and fifteen minutes since the announcement was made? For shame. How can they ever hope to get behind if they don't plan way ahead? Oh I know, just that's almost a year ahead. I am not saying it is a bad thing mind you. Just saying is all. The RPG superstar module is always in the following january I believe. What, all the art orders for the product yet to be written haven't been turned in yet? Snap, snap! I am really looking forward to this adventure! Can't wait to see what you do with it! A darn COOL mockup if you ask me! Just an fyi to Paizo. Your adventure sounds really fun to run as well as play, and has a great exotic flavour. Good luck with the writing process. I'm really looking forward to this one. I think people will see that it says Matt Goodall won in six other places, including the title of the e-mail, and realize that they're witnessing the joys of botched cut and paste in action where it says Neil Spicer. Geesh Neil Spicer won again? This contest is bloody fixed. I think my 15 minutes are just about up. I approve of this module. Can the title be just a mockup too? I love the concept, but Wes was right about the title. Ah, well. Call it [scary word] of the [color] [scary word], it'll still be great. As a lifetime fan of Gunga Din I'm hoping to see at least one of your NPCs played by Cary Grant! And good on you for your win. Okay I paid zero attention to the contest this year. But this looks cool. Grats! Can't wait for this to come out! To be fair, both previously published Superstar modules also use the "Blank of the Blank-blank" naming convention. When can we expect an ISBN for this one? I'm pretty sure we'll be asking and/or brainstorming up a new title for this one... but maybe not. There's certainly something to be said for keeping the title that won the whole thing! And we're unlikely to do a Vudra book (this adventure doesn't actually take place in Vudra, after all). Bah! I have no idea who this guy is. But the title is cool! Don´t change it. Yeah, my criticism of the name doesn't stem from the formula. I actually love the formula, even though I wouldn't want it to be used every time. In this case, it's how successfully the formula was used that I'm concerned with. The flavor of this module, as well as the punch of the name, can be much better served by another "Blank of the Blank Blank," if the convention is kept. This is going to be so awesome! The setting is killer and the adventure itself is crazy cool. We've updated the cover image—it's still a mockup, but it now has the correct logo placement—and we've added the ISBN to the listing. I like the art currently on the cover. Am I the only person thrilled to finally get some info on the Isle of Jalmeray and Vudrani culture? No! 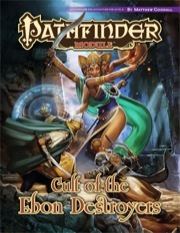 I would love to see much more of this area, but I fear it's not a high priority for Paizo in the near future, as it would ideally link in to whatever they do w/ psionics. Assuming they ever do. So is this going to have a Temple of Doom sort of vibe in it? The new cover for this is rather awesome. Agreed! Also good to know from the blog that Kieran Yanner, who does great work, is a good friend of Hyrum's. Let's hope that translates to more of his artwork in Paizo products!